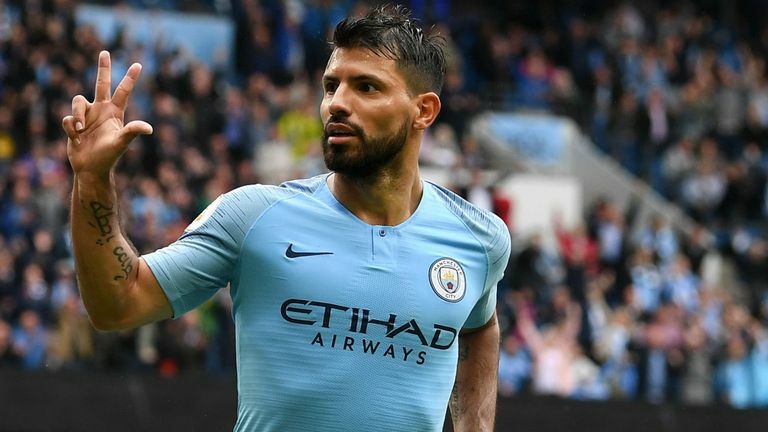 Sergio Aguero believes he is in "fantastic" shape after undergoing knee surgery in the summer. The prolific Manchester City striker missed the last month of last season's Premier League title-winning campaign to go under the knife. The 30-year-old seems to have put fitness issues behind him by making a positive start to the new campaign, with a hat-trick against Huddersfield last month among five goals he has already scored. "Honestly, I feel fantastic. Dr [Ramon] Cugat did amazing work with my knee and now I don't feel any sort of discomfort," he told the club's website. "During the past few years, I felt pains at times and when last season came to an end, we decided it would be best to start treatment. And the results were very positive. "I'm not sure if this is the best start [to] a season for me, but it's the best I've felt in years. It shows in my game. The challenge now is keeping up this level, and I'll be working non-stop to maintain it."